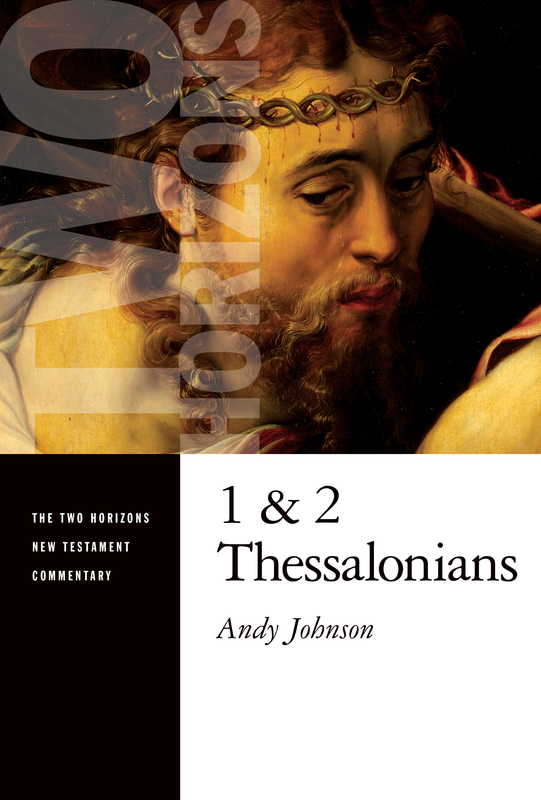 Andy Johnson’s new contribution in the Two Horizons series from Eerdmans on the two letters to the Thessalonians represents a theological interpretation of Scripture which is intentionally missional. As Johnson explains in his introduction, his goal in the commentary is to focus on elements of the text “most useful for facilitating the continuing formation of the church in its proper identity as a missional community” (2). The second goal of this commentary is to read the Thessalonian correspondence as part of the canon of Scripture. This means placing these letters into the overall story of the whole Bible and the mission of God to undo humanity’s rebellion. Although he does not use the phrase, his overview in the introduction is the familiar “drama of redemption” which drives most writing which self-identifies as theological interpretation of Scripture. As with most of the New Testament commentaries in this series, Johnson employs a post-biblical creed as a clarifying lens for “bringing 1 and 2 Thessalonians into focus (2). In the case of this commentary, Johnson uses the Nicene-Constantinopolitan Creed, but he also recognizes his place in the broader Wesleyan tradition as well as his openness to being instructed by other Christian traditions. There are occasional theological readings of the text which are informed by Johnson’s Wesleyanism. With respect to authorship and date, Johnson briefly surveys the state of the question and recognizes there is some merit to the arguments for non-Pauline authorship of 2 Thessalonians, but he remains unconvinced (7). But from a canonical perspective, it matters very little if Paul wrote 2 Thessalonians or not since the origin of the letters is of lesser importance to theological interpretations than canonical status. He provides several pages of excellent context drawn from Acts 16-18 and following the lead of Kavin Rowe’s The World Upside Down. Although this a brief overview, it is sufficient to enable Johnson to set these two letters in a proper historical and sociological context. In the body of the commentary Johnson works through the books in larger sections, commenting on some details of the text but falling short of a detailed exegetical commentary. This is to be expected give his stated goal to write a commentary serving the mission of the church. Greek appears in the body of the commentary with transliteration and Johnson does comment occasionally on grammar, syntax and rhetorical features. This makes for a very readable commentary which will be useful for a pastor or teacher as they prepare to preach or teach Thessalonians in a church context. Since this is a canonical commentary, Johnson pays close attention to intertextual echoes of the Hebrew Bible, although there are a few places where he hears an echo which Paul may not have explicitly intended. For example, commenting on several texts which may illuminate Paul’s understanding of the Man of Lawlessness, Johnson suggests allusions to Ezekiel 28:1-9 as the “most instructive text in this Old Testament trajectory” even if this was not an intentional allusion by Paul (289). This way of using the Old Testament to illuminate the New is not intertextuality (as it is usually defined), but more like an older hermeneutic where Scripture is the best commentary on Scripture. Although I think Johnson is certainly on the right track to draw attention to the arrogant actions of Adam in the Garden and the paradigmatic arrogant rulers in Isaiah 14 or Ezekiel 28 and the claims of these rules to be divine (as well as possible allusions to Daniel 11 and Antiochus IV Epiphanes), I would prefer to see an argument Paul had this trajectory in mind when he described the Man of Lawlessness, especially in the light of where that trajectory may lead the interpreter who is trying to draw out implications for contemporary application. One of the primary features of a Two Horizons commentary is a lengthy section on the theological implications of the commentary. Johnson’s reflections on 1 and 2 Thessalonians begin with a section on holiness. Holiness is Spirit-enabled and derived from the triune Godhead. It is “intensely personal but necessarily corporate, public and missional” (255). In these two letters holiness is fidelity to God and “cruciform living” (following Michael Gorman, but also influence Gorman’s recent Becoming the Gospel). This section focuses on cruciform living, love of enemies and peacemaking. This section reflects Johnson’s previous articles on holiness and sanctification in the Journal of Theological Interpretation. Since eschatology is one key area for the theology of the Thessalonian letters, Johnson devotes a long section to the unique issues raised in 1 Thessalonians 4 and 2 Thessalonians 2. He highlights three types of eschatology in the letters. First, the Parousia is described as representatives of a city going out to meet a victorious king and escorting him into their city. Related to this image is the second, the Parousia as eschatological warfare. Here Paul stands on the foundation of Isaiah. Third, the Parousia is a judgment theophany, especially in 2 Thessalonians 2. God demonstrates his “ferocious love” which restores shalom. But Johnson argues Paul stops short of describing “conscious everlasting torment in Hell” (269). Perhaps this is a theological observation driven by theological commitments, but it is a fact Paul does not describe what sort of judgment awaits the Man of Lawlessness other than his utter judgment. Johnson devotes a few pages to Dispensational interpretation of 1 Thessalonians 4:13-18. Although he does admit Dispensationalism is a kind of theological interpretation of Scripture as practiced in this commentary, he is equally clear the theological suppositions of Dispensationalism are wrong. Perhaps this is a problem with the idea the popular theological interpretation method, since (potentially) any “rule of faith” could be applied to a text as a theological lens. For example, Johnson is a Wesleyan and he consciously interprets the Thessalonian letters as a Wesleyan. Someone could approach Thessalonians with a Lutheran or Anglican set of assumptions and find some slightly different nuances in their interpretation. But why should any given theological structure be discounted a priori? It seems as though any theological lens is possible even if it is not the preference of a particular scholar. Johnson dismisses Dispensationalism as a theological lens because it does not “square with Scripture,” but someone might equally dismiss his more Wesleyan views expressed in this commentary for the same reasons. Although Johnson is fair towards Dispensationalist readings of 1 Thessalonians 4:13-18, his argument is blunted by his used of dated scholarship, or non-scholarship. He cites the Scofield Reference Bible and Hal Lindsey frequently and occasionally the brief commentary on 1 Thessalonians by Constable in the Bible Knowledge Commentary, a single volume New Testament commentary produced by the faculty of Dallas Theological Seminary. At best this use of popular level and dated material makes his critique of Dispensationalism appear to be a straw man argument. There are many books and articles which better treat 1 Thessalonians 4:13-18 from a dispensational perspective than these. Conclusion. These criticisms aside, Johnson achieves his goal to provide a Spirit driven commentary which is dominated by the redemptive mission of God. The commentary is a fine example the state of Theological Interpretation of Scripture and will be a useful commentary for pastors and teachers as the work to apply these two early letters of Paul to contemporary mission of the Church. “At best this use of popular level and dated material makes his critique of Dispensationalism appear to be a straw man argument.” I get so very tired of this. I read a Michael Horton book where he kept referring to Lewis Sperry Chafer as the leading dispensationalist! Uh, like 100 yrs ago. How about interacting with more recent scholarship? Thanks, Laura. Chafer died in 1952, but most of his books date to the 1920s. Since the notes in the Scofield Reference Bible were substantially in the 1960s, resulting in the New Scofield, and again in the 1980s there a series of meetings at ETS resulting in books like Robert Saucey’s Case for Progressive Dispensationalism. None of that work is ever cited in discussions of what dispensationalists believer, mostly because Left Behind warps everyone’s opinion. I have noticed several recent publications (mostly from Kregel) which would have been called dispensational twenty years ago, but now the word is not used at all even if the ideas in the books are clearly from a dispensational perspective.